Ambassador Young-mok Kim of KOICA addresses international participants on the Role of Korea in Sustainable Development in Seoul. It is a great pleasure and privilege for me to be invited to speak at this forum. I want begin by thanking and congratulating the Asia-Pacific Peace and Development Service Alliance (APPDSA), the United Nations Economic and Social Commission for Asia and the Pacific (UN ESCAP), Global Peace Foundation (GPF) and Korea Council on Foreign Relations (KCFR) for co-hosting the Global Forum on the Role of Republic of Korea in Development. I am very delighted to be given an opportunity to deliver featured remarks at this important international forum that brought together such a wide range of distinguished participants from home and abroad. I believe that you are already familiar with the news that the international community has agreed to conclude the Sustainable Development Goals (SDGs), which will guide us in the next 15 years. As the first country to escape poverty and achieve economic and social development as well as democratization, I believe the SDGs present us with an opportunity to expand our footprint and visibility in the development arena and live up to international expectations. By taking today’s opportunity, I would like to discuss Korea’s future contributions to the SDGs, KOICA’s role as Korea’s representative development platform and the importance of volunteerism in the context of the SDGs. It is safe to say that the historic new era of development has dawned with 193 UN member states agreeing to unanimously adopt SDGs with 17 goals and 169 targets. Since the declaration of the Millennium Development Goals (MDGs) in 2000, the world has made a great stride in terms of addressing diverse challenges facing humanity, including successfully halving poverty. Despite this progress, we still need to remain committed to development. Globally, 836 million people are still living in extreme poverty and about one in five people in developing countries lives on less than $1.25 per day. In addition, the world face new challenges such as climate change, terrorism and epidemics that need to be resolved. This is why we need a new framework of global goals to meet challenges in the rapidly changing environment. At the UN General Assembly, the Korean government also expressed its strong willingness to get behind international efforts to meet the SDGs. I am very proud that KOICA will stand at the forefront of such an ambitious resolve. I and my staff actively participated in discussions taking place at the UN and shared our strategy and efforts. In talking about how we can achieve these goals, it is imperative that we take into account the core elements that underpin the SDGs, people, planet, prosperity, peace and partnership. I believe these are elements that should be placed at the heart of what we do. In particular, I would like to put strong emphasis on partnership because I believe a revitalized global partnership based on a spirit of global solidarity is required to mobilize all the means necessary to meet the SDGs. For this partnership to happen, we need to identify new opportunities for partnerships by engaging all stakeholders, including governments, businesses, civil society and academia. As the premier aid agency of the Korean government, KOICA is already studying ways to mainstream the SDGs into its work. To this end, we have put sustainability, inclusiveness and evidence-based results as core elements of our work to expand our visibility and live up to international expectations. Setting the SDGs as a guide, we are very much committed to meet international standards and make real and impactful differences on the ground. Over the past half a century, Korea experienced unprecedented economic growth. From the time of crushing poverty to being the 13th largest economy of the world, Korea experienced tremendous socio-economic transitions. Of course, there are multiple factors that made Korea’s development possible, such as coordinated and effective government actions and policies, people’s willingness to change, etc. However, I want to highlight Saemaul Undong as one of the most important movements in Korea’s development history. Indeed, during UN General Assembly, a Special High-Level Event, “A New Rural Development Paradigm and the Inclusive and Sustainable New Communities Model Inspired by the Saemaul Undong”, was organized to explore the potential of Saemaul Undong in development. I want to tell you how rural development through Saemaul Undong still remains relevant today. As the largest source of income and jobs for rural households, it provides jobs to 40% of global population. In developing countries, rural regions are especially important because 70% of population lives there. In Korea, thanks to Saemaul Undong, the poverty rate was reduced from 34.6% to 6% and rural household’s income reached parity with that of urban households during the period of 1967 and 1984. This clearly illustrates far-reaching impacts of Saemaul Undong. Capitalizing on this Korea’s unique development experience, we have launched Smart Saemaul Undong to catalyze inclusive growth in developing countries. In addition, KOICA will share our knowledge and know-how with partner countries to nurture human resources and build effective institutions. In particular, we will harness the power of science and technology and focus on impact and evaluation to produce lasting results. In this way, we believe we can make substantial contributions to the SDGs. The other point I want to discuss is the power of volunteerism in contributing to development around the world, which is very relevant to the theme of today’s forum. As some of you probably know well, Korea has a strong history of international volunteering. However, the beginning of Korea’s international volunteering was very humble with 44 volunteers deployed to only four countries in 1990. From that time to the birth of World Friends Korea, the integrated brand of Korean government’s volunteer programs in 2009, World Friends Korea has given opportunities to over 50,000 overseas volunteers to share Korea's technology and culture with the world. Today, we are sending more than 4,500 volunteers to 50 countries on an annual basis, ranking 2nd in the world in terms of the number of volunteers it sends to developing countries. It has been upgraded into a platform that engages diverse social classes, including young high school graduates and retired professionals through Dream Volunteer and Senior Volunteer programs. This shows our commitment to the people-centered engagement platform that strengthens partnership and exchange between Korea and developing countries. Once again, the partnership is at the heart of our operational principle. We are working in close alliance with Peace Corps, JICA, UNV and the National Youth Council of Singapore to expand our footprint and increase visibility on the global stage. It gets really emotional when I see Korean volunteers working with Peace Corps volunteers who used to help us in remote marginalized villages and schools with nothing but their passion to make a difference. From 1961 to 1981, Korea has received about 2,000 Peace Corps volunteers. Keeping this in mind, we consider two points in our operation. Firstly, the history of being a recipient of international volunteers puts us in a position to engage in volunteerism that effectively addresses needs of developing countries. Secondly, we recognize the importance young people who constitute 80% of World Friends Korea. As educators, nurses, technicians, social workers and advisors, Korea’s young population share their passion and vision with people across the globe. This endeavor really adds value to the whole World Friends Korea and makes us a true global friend. In our common journey toward the SDGs, volunteerism is a great asset that can underpin the progress toward ending poverty, addressing inequality and creating an enabling environment for development. The State of the World’s Volunteerism Report published in 2015 illustrates this aspect of volunteerism well by identifying “volunteerism as a key channel of engagement in local, national and global contexts that can contribute to the implementation of a truly people-centered development model”. Keeping this in mind, it is important that we facilitate participatory engagement by harnessing the power of volunteerism to meet the key principle of the SDGs. KOICA is also focusing on the potential of volunteerism in addressing global challenges. For instance, KOICA’s presence in the “Asia-Pacific Forum on Volunteerism to Promote Participation, Development and Peace” illustrates our willingness to get young people on board in carrying our various development programs. Started in Asia Pacific region in 2014, this forum was a truly good opportunity for KOICA to share its experience with interested partners, learn about best practices and enhance our partnership with international volunteer-sending organizations. By joining hands with other partners in announcing the Asia-Pacific Youth Declaration (Bangkok Statement), we were able to form an alliance of upgrading our volunteer program and fostering the force of young people who can play crucial roles in the development cooperation arena. In this endeavor, World Friends Korea (WFK) is committed to playing an important role in facilitating engagements with youths to maximize their contributions to development. To further expand our roles in this area of growing importance, KOICA will keep supporting WFK’s roles to enhance and upgrade the current way of engagement. Through WFK, we will also share best practices, challenges and lessons learned with international partners to continue to promote volunteerism as an important ingredient in development. As we talked about the significant growth of volunteerism in Korea, its relevance with SDGs remains to be a key challenge for us. To make international volunteering more aligned with the SDGs, we are making efforts to upgrade our volunteering programs. One of these efforts is to create new measures to better keep track of the performance of our volunteers. In doing so, we hope to guide their activities more effective and more geared toward local needs and conditions. We are also working to expand the areas of service of volunteers to meet diverse development challenges such as inequality, urbanization, climate change and natural resources. As we are uniquely positioned to share Korea’s experience with the world, we incorporate models, elements and success factors of Korea’s development into our volunteer program to maximize the effectiveness. 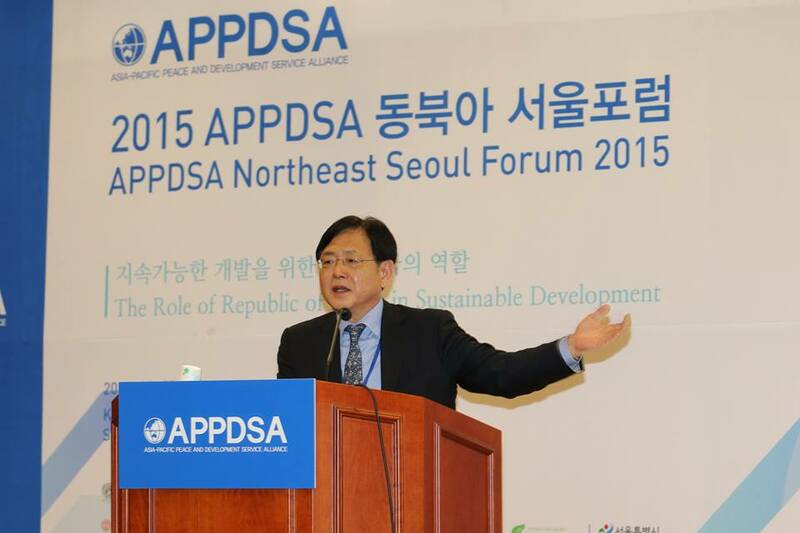 In closing, I would like to emphasize the role of Korea in leading and inducing positive changes toward development. A common phrase following Korea is that it is the first and only country to turn itself from a recipient country to a donor country recognized by its membership into the Development Assistance Committee of OECD. As the first and only country that achieved development in its true sense, I am sure we have a lot to share with the international community. Our experience in development shows us that we have sufficient capacity to contribute to the common journey of the world. In particular, sharing Saemaul Undong through KOICA’s Smart SMU Initiative can foster ownership at national and community-levels in developing countries and put them on the path of inclusive and sustainable development. We also recognize the growing importance of volunteerism as a powerful tool for civic engagement that facilitates people-to-people ties. By supporting WFK, KOICA can and will make sustained efforts to bring volunteers into our efforts to achieve development in developing countries. In this context, it is my sincere hope that today’s forum produce meaningful outcomes by discussing development challenges facing Asia-Pacific region and exploring Korea’s position and opportunities in the era of the SDGs. Once again, I would like to congratulate you on the organization of this forum today and thank you for inviting me today. I wish you all the best for every participant.